In December 1997, five graduate students from the University of California at Santa Barbara joined Michael Beckerman in a trip to Prague, where the group presented a series of lectures at the Bohuslav Martinů Foundation. The presentations were the result of collaborations between Dr. Beckerman and his students and were given as a collective effort. Sponsored by the Foundation, the Museum of Czech Music, the Dvořák Museum and the Historical Club and Foundation of the Open Society Fund of Prague, the lectures coincided with the annual Bohuslav Martinů Festival. The participants included Erik Entwistle, Derek Katz, David Malvinni, Diane Paige, and Thomas Svatos. Two presentations were given on December 15th, beginning with Janáček and the Ordinary read by Derek Katz. In this paper, the final scene of Kát'a Kabanová was used to suggest that, in some ways, Janáček's operatic music exploits musical and dramatic devices from the nineteenth-century European repertoire. Moments in Kát'a were compared to excerpts from operas by Verdi, Puccini and Gounod, in order to suggest that Janáček makes use of familiar operatic situations such as the love duet and the mad scene. Mr. Katz argued that the emotional content of these familiar situations are easily decoded, even by audiences that might not understand the Czech text or be well versed in Janáček's music. The next paper presented, entitled Dvořák and Anxiety, was researched with the assistance of Diane Paige and delivered in Czech by Dr. Beckerman. Dealing with a subject previously glossed over by many Dvořák scholars, the paper explored in detail the nature and extent of the composer's psychological afflictions, and their manifestations in his behavior and possibly his compositions as well. Did Dvořák suffer from crippling neuroses? If so, this would significantly alter - and enrich - the traditional image of the composer as a simple and robust peasant. The implications suggested by the paper generated a lively discussion among those in attendance. There was considerable resistance among some of the Czech scholars to the idea of viewing Dvořák in this light, and some questioned the purpose or usefulness of such a study. It was clear that a strong desire to protect and preserve the composer's image continues to influence Dvořák reception and criticism. The remaining two papers were given on December 16th; the first, Martinů and the Politics of Stasis, was read by Erik Entwistle. Martinů's prominent use of pastoral or idyllic musical imagery was examined in the light of politics, critical reception, and the composer's maturing style. Mr. Entwistle argued that such 'simple' passages might be taken at face value, as the Communist regime in Czechoslovakia did when they adopted Martinů as a good nationalist composer who expressed his fervent love for the homeland. It was further suggested that Martinů's idylls may be the key to a deep-seated ambivalence held by the exiled composer, suggesting more complex interpretations of such passages and their role in Martinů's music. The final presentation, given by David Malvinni, dealt with the problematic category of Gypsy Music. The numerous examples of so-called Gypsy music which opened the talk, complemented by excerpts from the film Latcho drom, proved how divergent the genre actually is. The current efforts to find common political and philosophical ground among the world's diverse Gypsy populations is not going to be as simple as creating a Gypsy music category in the CD bins of music stores. Mr. Malvinni pointed out that the world of Gypsies is rife with contradiction and paradox as the struggle for self identity continues, with Gypsy music providing a perfect reflection of the current situation. The papers were well received by knowledgeable and responsive audiences, which included many local scholars and students. All who participated are grateful to the individuals and institutions whose support made this trip possible, and a special word of thanks is due to Aleš Březina, Secretary of the Bohuslav Martinů Foundation, whose organizational efforts contributed greatly to the success of the lectures. - Erik Entwistle Note: Click here for the program of the Bohuslav Martinů Festival held in December. The concert hall in St. Agnes Cloister is a place where one might expect to encounter the past, but it was almost disconcerting to find historical fragments of our own century. Yet it was just such a curiosity that appeared during a concert of the Sándor Végh International Chamber Music Academy on December 18, 1997. Performed under the auspices of the Martinů Festival, the highlight of the concert was Lydia Kavina's astonishing performance of Martinů's Fantasy for Theremin, oboe, string quartet and piano written in 1944. The Theremin (sometimes referred to as the Thereminvox) was invented by the Russian physicist Lev Theremin in 1920 and has its place in the history of music as the first electronic instrument. Consisting of two antennae, one looped and the other straight, the sounds of the instrument are produced by movements of the player's fingers and hands in the air. One hand seems to move as if it were conducting an imaginary symphony--this regulates the dynamics. The other looks as if it is signing to the deaf with particular precision, and it is this motion which produces differences in pitch, and also gives the eerie impression that tones are being plucked out of the air. reject the idea of attending a concert where one watches speakers in favor of those with human participants. This may at least in part explain the revival of the Theremin as a concert instrument. Lydia Kavina is a master of the instrument, with a certain unique background. 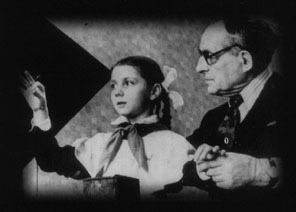 She is the grand-niece of Theremin, and begin playing at the age of 9 when Uncle Lev came by to teach her. Remembering that time she says: "Theremin came every week, but it wasn't like lessons, rather it was like making music. He was a very soft man, and would not have thought of giving difficult exercises to a child. Very soft. Perhaps he was too easy." The technique she now uses was developed by Clara Rockmore, a former violinist who became a Theremin virtuoso in the 1930s and 1940s. Martinů on the Theremin is a kind of revelation. This wanderer and eternal exile was a conspicuous seeker of stable musical moments, which might be called pastorals. Anyone even slightly familiar with Martinů's musical language recognizes such things: all harmonic tension is reduced to naught, folk stylizations reign in the upper registers, sweet timbres are carefully cultivated. These moments occur in Fantaisies symphoniques and in the middle movement of the 2nd violin concerto. We hear them briefly in the forest scene from Julietta and one such version in Spalíček is blatantly titled Paradise. When played on the Theremin at this concert, such moments were especially sublime, for the purity of intent was matched by an innocence of sine tone and the magical images of sounds emerging from the ether. Lydia Kavina, dressed in a tight silvery dress seemed herself to glow, like a character in a science fiction story about a Czech composer. Her expressivity and musicianship were obvious. As she later put it: "The performer is the image of what they play, you can't just push a button. You are playing by ear and so the player must concentrate on the sound. The instrument demands your musicality." The sound of the Theremin has an element of caricature to it, especially for those who watch science fiction movies, since its other-worldly sonority became the preeminent aural staple of alien weirdness, but there is more than that. Kavina says: "The Theremin is quite flexible. It has special techniques and you can change the sound to any situation. It can be warm and expressive, or cold and strange. It has its electronic sound and also has a sensibility like a cello or a voice." This flexibility was very much in evidence in Kavina's performance of Martinů's Fantasy, which accomplished something unusual. Not only did it call attention to an unknown masterpiece and show that the composer knew exactly what he was doing with the Theremin, but in its profundity and inevitability it seemed to shed light on Martinů's whole oeuvre, illuminating it in that shimmering silvery light that once heard is never forgotten. Though Martinů never again wrote for the instrument in the remaining fifteen years of his life, he used it to communicate something essential about himself and his musical thinking. Editor's Note: For additional information on the theremin and/or Lydia Kavina you may access the Theremin homepage at http://www.Nashville.Net/~theremin. This site also contains a link to the website for Ms. Kavina, or you may access it directly at http://www.Nashville.Net/~theremin/kavina.html. ... It was almost too good to be true. I knew British audiences and scholars had a particular fondness for Czech music. The Dvořák Society mailings had kept me informed of the numerous concerts in London and elsewhere in Great Britain that included works by Czech composers. And I knew if you wanted to hear Czech music outside the Czech Republic, one of the best places to go was England. But who could have imagined that even in this Czech haven it was possible to be treated to an entire week of Martinů's music?! Yet that was exactly the case! The Guildhall School of Music & Drama and the BBC Symphony Orchestra had joined forces to present a week-long festival from January 12-18, 1998 which they appropriately called Martinů: Out of Exile. For indeed it was during this week that Martinů emerged from the shadows and introduced his music, much for the first time, to a grateful audience. The organization of this Martinů marathon was coordinated by the Guildhall School with performances, lectures, master classes, receptions and a panel discussion during the week (January 12-16) while the BBC took up the standard for the weekend (January 16-18) with a series of similar activities. The chamber orchestra concert scheduled for January 16 (1:05 p.m.) had to be canceled due to a water main break that required closing the hall. The concert was to have included the works covered in Wednesday's masterclass by Maestro Bělohlávek, i.e., Sinfonietta la Jolla, Concerto for Harpsichord and Chamber Orchestra and Sinfonia Concertante. The canceled performance was to feature the Guildhall Chamber Orchestra and student conductors Jason Lai, Pawel Kotla, and Pablo González. Masterclasses were offered on Tuesday and Wednesday mornings. The first was conducted by Prof. Ivan Štraus from the Prague Academy of Music, who focused on bringing out the subtle nuances of Martinů's Sonatas Nos. 1, 2, and 3 for violin and piano with students from the Guildhall who were already near perfection in their technique. The second masterclass was directed by Jiří Bělohlávek, now Principal Guest Conductor for the BBC Symphony Orchestra, who provided well-considered advice to the student conductors of the Guildhall Chamber Orchestra. stage and the breadth of subject matter covered in his fourteen operas. Native American percussion instruments from Mexico and Arizona. place of Martinů's music in British concert life today. music inclines towards symbolism and transcendence. Informal panel discussion with lecturers and members of the audience. The weekend's program guide opens with the following: "The BBC Symphony Orchestra's January weekends have become a highlight of the musical calendar and this year's celebration of Czech composer Bohuslav Martinů is no exception." And indeed, if this weekend had been anything less than their statement suggests, then the BBC's musical year must indeed be superhuman. Throughout the week, participants and visitors could browse through the exhibition titled Wanderings, Changes, Returns, which traced Martinů's life and work in pictures and documents. The exhibition was prepared in 1990 by the Dvořák Society of Great Britain in collaboration with the Martinů Society in Prague to mark the centenary of Martinů's birth and first appeared at the Edinburgh International Festival. And even the Balcony Cafe, housed in the Barbican Center, joined in the spirit of the weekend by adding a selection of Czech foods to their menu. Weekend performances featured a gratifying combination of students from the Guildhall, the BBC Symphony and Philharmonic, and guest artists. The official program began on Friday at 5:30 p.m. with students from the Guildhall performing the sonatas they had rehearsed with Prof. Štraus on Tuesday, followed by a introductory talk by Dr. Jaroslav Mihule on Martinů's life and music. Students also performed on Saturday and Sunday afternoon selections from Martinů's chamber music featured in the Guildhall concerts earlier in the week. And then I awoke from the dream that had transported me for seven days to a precious land where a little boy looked down from his tower home over the small village and fields that surrounded it, from 1930s Paris whose air was filled with the strains of vibrant jazz tunes, from listening to the thoughts of a lonely man exiled by the war from his beloved home, and from shedding tears with this same man who returned home only in his dreams ...to the memories of children clearing the streams in early spring to allow the water to flow freely once again, nourishing the woods and fields in its vital embrace, woods and fields to which he (and we) can never return. Some might have viewed this week as just another over-exuberant attempt to force the music of a comparatively little-known composer down the throats of an unsuspecting public. With those, if they exist, I would argue until I had no voice. And I have no trouble finding professional critics to support my view. Richard Morrison of The London Times called Martinů a "tragic genius" and The Greek Passion "startlingly dramatic and intensely beautiful"; Rob Cowan of the Independent thought the Double Concerto "secured Martinů's place alongside Bartók and Stravinsky"; and Matthew Rye of the Daily Telegraph found the weekend "with such an engaging composer to be a fascinating, moving experience." As for the others, well I admit everyone is entitled to their opinion. So in the end, I can speak for no-one but myself, but as for me - it was a week that brought new and welcome insight into Martinů, the composer and the man, and left a fond and inspiring memory to which I will hold tenaciously. Since the arrival of Professor Michael Beckerman in 1993, the University of California - Santa Barbara has become a national center for the study of Czech music. The Music Department at UCSB has offered many courses in Czech music including seminars on the works of Janáček and Martinů, and a two-quarter seminar on the history of Czech music which resulted in a number of published papers. In addition, general offerings in the Department have also focused on Czech music, including a seminar on melodrama which concentrated on the works of Zdeněk Fibich. Czech music has also figured prominently in courses on program music, nationalism, folk music and Gypsy music. There are at present six students who are writing dissertations on various topics in Czech music including Janáček and Feminism, Gypsy Music, and Martinů and Aesthetics. Students in the program have presented their work both here and abroad, participating in conferences in Prague, Brno, St. Louis, Spillville (Iowa), and Stanford, and have published in such venues as Opera Quarterly, The Musical Quarterly, 19th Century Chamber Music, and The New York Times. the noted violinist Martin Kaplan. Students have also presented lecture recitals and pre-concert talks. We have also brought Czech music to the community with public lectures at the Karpeles Manuscript Museum and the Santa Barbara Chamber Orchestra. One of our students has been awarded an IREX grant for next year to conduct research in the Czech Republic, and another is currently in residence at the Martinů Foundation Study Center in Prague. ... The Library of Congress has an extensive collection of published material related to folk songs in the former Czechoslovakia. These materials are located in the Music Division and the Folklife Center, however, because of cataloguing changes, these items cannot be found easily through general computer searches. At present, a more effective approach is to take an existing bibliography and search for authors and titles individually. For those with additional questions about the collection, contact the Folklife Center though their homepage (lcweb.loc.gov/folklife) or by e-mail (folklife@loc.gov) or fax (202-707-2076). ... Some time ago I received a letter from Mayor Adolf Grošof of Tři Studně informing me that a local committee has been formed to establish a memorial and museum to honor Vítězslava Kaprálová (1915-1940) in the village of Tři Studně. Mayor Grošof describes Tři Studně as the charming place where Kaprálová spent her childhood and where she was happiest. It is only appropriate that this be the site of the memorial and museum. The estimated cost of the project is 2,000,000 Kčs (the current equivalent is approximately $64,000). The local Parish Council has already donated land on which to build the memorial. Josef Kaprál, Vítěslava's cousin, has been appointed to manage the project. A design for the building to house the memorial and museum has been commissioned from a local architect of the firm Halva. Planning permission has already been obtained from the District Council. But in order to proceed, the fundraising committee needs our help. If you would like to support this project, you may send your donations in any currency or by check, payable to the account of Obec Tři Studně, to Major Adolf Grošof, Obecní Úřád, Tři Studně, 592 04 Fryšava, Okres Žďár nad Sázavou, Czech Republic. *Much of the biographical information on Kaprálová was obtained from Jiří Macek's article in the New Grove Dictionary of Music and Musicians (London: Macmillan Publishers, 1980), 800. Anthony Philip Heinrich... What is described as "the most extraordinary opus 3 in the history of music," by a Bohemian-American composer, is now available in a reprint edition. Anthony Philip Heinrich was born in 1781 in Krásný Buk, but by 1817 was in the "wilds of Kentucky" (his words), teaching himself to compose. His first works were published in Philadelphia in 1820 in two collections: The Dawning of Music in Kentucky, or the Pleasures of Harmony in the Solitudes of Nature, opus 1, and The Western Minstrel, opus 2. More of his works are contained in The Sylviad: or, Minstrelsy of Nature in the Wilds of North America, opus 3, published in Boston in 1823 and 1825-26. Its original purpose was to impress the Royal Academy of Music, to which it is dedicated, before Heinrich traveled to London to advance his career. The Sylviad was recently republished by Conners Publications in Wisconsin. The 34 works (for piano, solo voice, or vocal ensemble) are sometimes amusing, sometimes simple, sometimes fiendishly difficult, especially the two toccatas for piano. Not only was Heinrich America's first genius of art music, in the pages of The Sylviad are found many avant-garde elements of the Romantic century: virtuosity, extreme chromaticism, complex experimental harmonies, unconventional formal structures, expression of personal feelings and experiences, and intense nationalism. A description of his works with Bohemian associations was written in "Anthony Philip Heinrich: Cechoamerican and pionýr národní hudby," Opus musicum 24/9 (1992), by J. Bunker Clark (University of Kansas). Clark also prepared The Sylviad reprint, for which he wrote the introduction. Bach and the Bohemians - Karen Walthinsen [a subscriber to the Czech and Slovak Music Society discussion list] gave with the Spokane String Quartet a concert on period instruments (February 8) as part of the Northwest Bach Festival (Gunther Schuller, dir.) entitled Bach and the Bohemians. Also participating were Margriet Tindemans (viola and viola da gamba) and Ilton Wjuniski (harpsichord). The program featured works by Schmelzer, Biber, Zelenka, J.S., C.P.E. and W.F. Bach. Josepha Ridding [a recent subscriber to the Czech and Slovak Music discussion list] is currently working on her Ph.D. at Kingston University, U.K. and has supplied the following information regarding her research. Ms. Ridding is focusing her study on the connections between the rhythms of the Czech language and those rhythms produced in the performances of Czech musicians. She is particularly interested in the influence of spoken language on the musician's planning of rubato structures in musical works. Ms. Ridding has looked particularly at the role of the pianist in this context but is interested in information regarding other instruments as well. If you would like to contact Ms. Ridding regarding this topic or have information that may be helpful to her in her research, you may reach her via the discussion list at csmsd-l@yahoogroups.com. Geoffrey Chew has graciously provided a guide to pronouncing Czech which may be accessed at http://uweb.ucsb.edu/~jpearl/csms/czpronounc2.html. A link to this site has also been added to the Czech and Slovak Music Society homepage. The bibliography is divided into categories including books and scores; articles; lectures; recordings; courses, seminars, and workshops; and works in progress. The list is further subdivided by composer, historical period, etc. Recent additions to the bibliography are indicated with an asterisk (*). Although the newsletter is published only on a quarterly basis, additions to the bibliography will be made more frequently (i.e. as soon as information is received). The bibliography may be accessed directly at http://uweb.ucsb.edu/~jpearl/csms/csmsbiblio.html. Performances at the National and State Theaters in Prague have not been included but may be accessed under Národní divadlo above. includes Bruch's Violin Concerto No. 1 and Janáček's Suite from The Excursions of Mr.
Brouček, in its first performance by the SLSO. be held April 6 at the Sheldon Concert Hall. Mina Miller is best known for her recording of the complete works of Carl Nielsen as well as research guides and scholarly work on that composer. Her recent recording of Janáček's piano works (In the Mists, On an Overgrown Path, Books I and II, and Sonata 1.X.1905), while a welcome addition to the small body of Janáček recordings, is not without its problems. There is no doubt that Miller has made every attempt to understand the difficult and often cryptic musical language of these pieces. True to her scholarly inclinations, her liner notes prove that she has familiarized herself with Janáček literature, providing a succinct, but well-rounded precis of the composer's life and musical influences. Miller's reputation as a scholar-artist is encouraging; one expects a carefully planned and insightful interpretation of these works. Yet she consistently disregards interpretative markings and fails to replace them with much of interest. Subtle nuances which demand slight gradations of tempo and dynamics (such as the final movement of In the Mists) are lost to an almost monochromatic rendering of the pieces. While Miller does provide rubato throughout (as she should), its use is often puzzling and does little for the continuity or rhythmic integrity of the piece at hand. Is her interpretation of the fifth and final movement of the second book of On an Overgrown Path the result of artistic license or simply a disregard for the printed rhythm? One is never sure, since rubato colored sections seldom strike the listener as a confident attempt to do something different. Miller's choice of voicing, or at times a seeming lack of voicing, provides one with few clues about her real interpretation of these pieces. Whatever her intentions, they are seldom clear to the listener; what results is a rendering of these works that is in itself enigmatic. With the recent re-release of Rudolf Firkušný's 1972 recording of the piano works on Deutsche Gramophone in a two-CD collection, one is less inclined to investigate Mina Miller's disc. Firkušný's refined tone, subtle renderings, and careful attention to the music's multiple layers make this collection a must have for Janáček lovers everywhere. A special welcome to those who have recently joined the Society. Annual membership dues for the Society are detailed on the Czech and Slovak Music Society Membership homepage at http://artsci.wustl.edu/~jamabary/csmsmemb.html.